When Bill and I were newlyweds, we lived right behind my school in a fixer upper with a ton of potential. We did a few things to it but we were renters so there wasn't a lot we could do. Because our little cottage was so close to the school, I was convinced that I'd finally be on time for work. I was always a minute or two late - every. single. day. 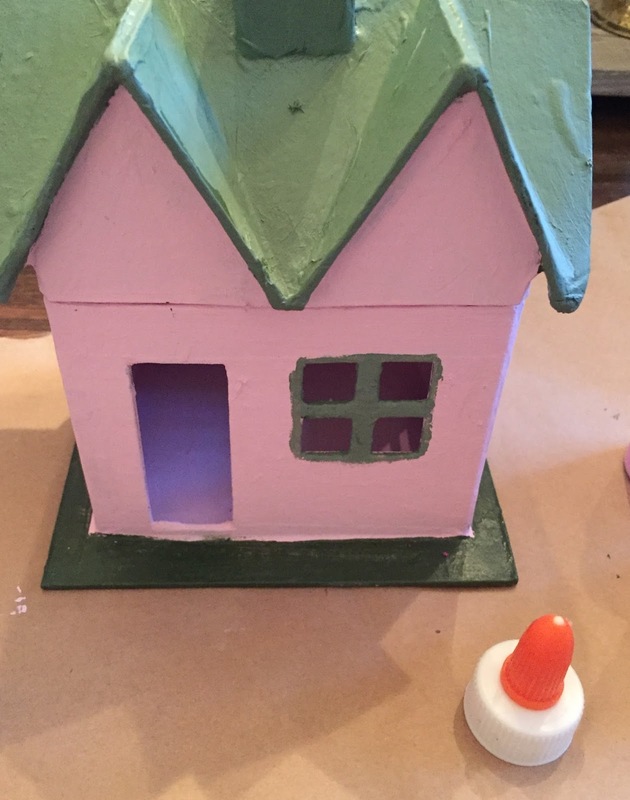 I'm running a little late to the party with this sweet, crafty cottage but it's a "better late than never" craft because it was so much fun to make. These cardboard cottages are readily available at the craft store. I got this one at Michael's. It was painted with two colors of paint. It needed a little something, so a door and shutters were cut out of some left over cardboard. 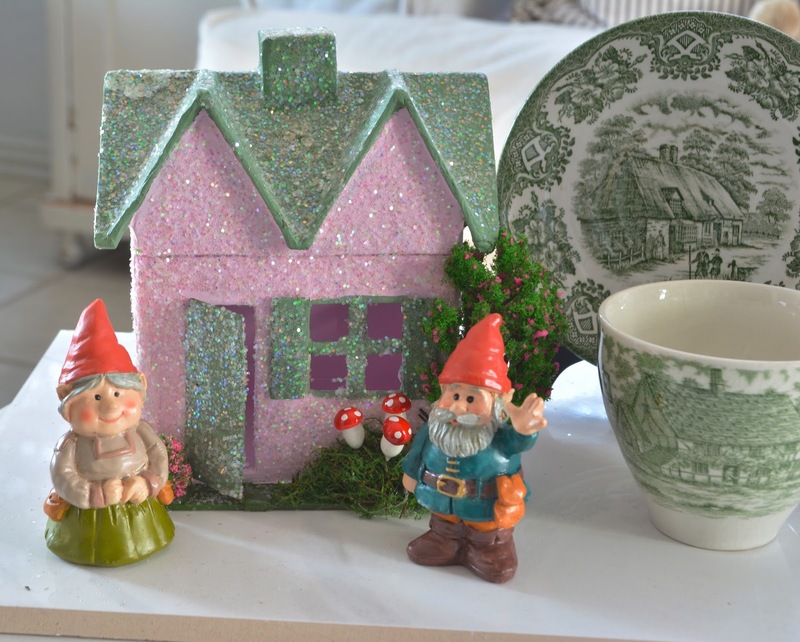 I spread Elmer's glue all over the cottage and sprinkled it with iridescent glitter. 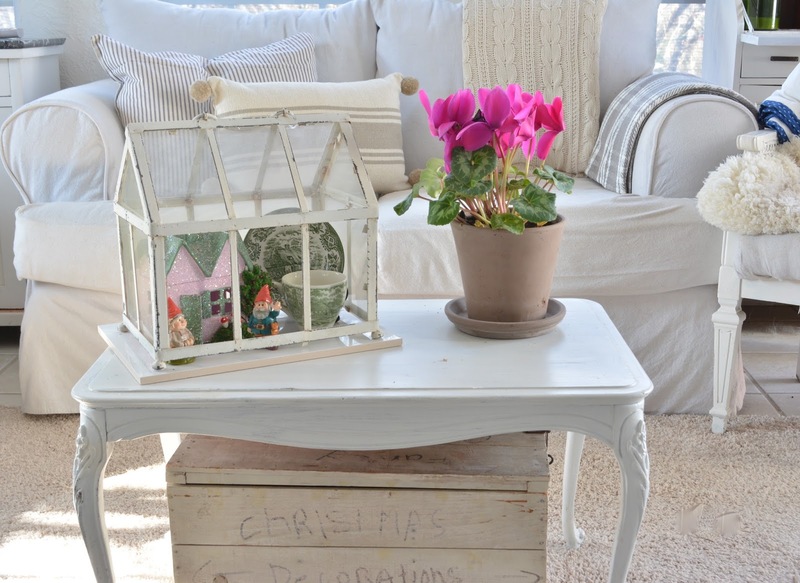 My cottage was landscaped with a tree, a shrub and a few darling mushrooms. All of these were found in the Fairy Garden aisle at Michael's. 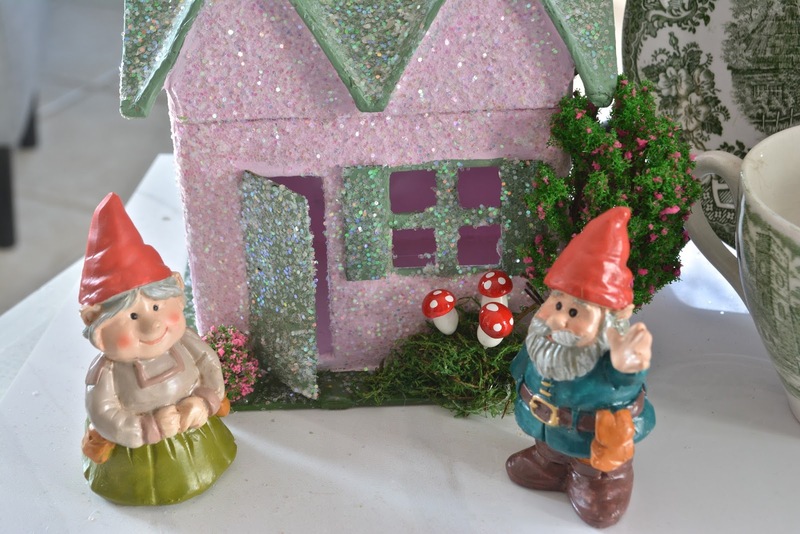 Mr. and Mrs. Gnome love their new digs. Cottage, with coupon - $3.03. One tree - comes in a package of two - $2.65. One topiary with the stem cut off - .75 cents. These come in a package of four. Three precious mushrooms - .45 cents. There were 20 adorable mushrooms in the package. I had the moss, paint, glue and glitter. I can't wait to use the mushrooms for another project. They are so cute. 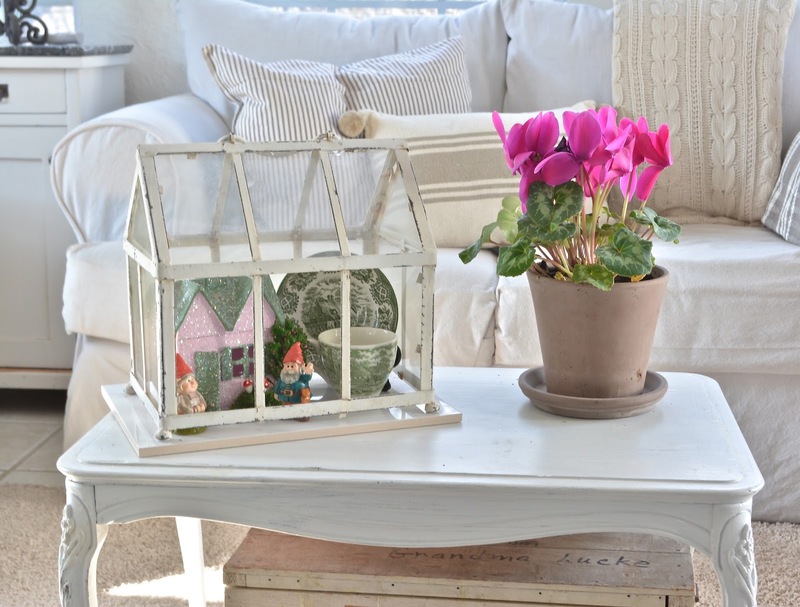 The plant is a cyclamen. The throws are from Tuesday Morning. I made the ticking pillow ages ago. 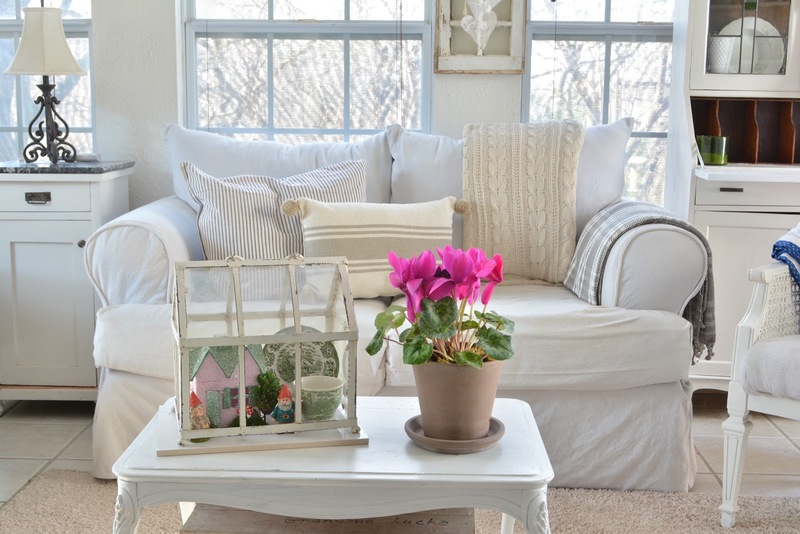 The ecru and tan Farmhouse Style pillow is a new cover from Hobby Lobby. The crate is from my grandparent's house. My brother lived with them for a while. The handwriting is his. I use it to store my plaid tin collection during the off season. I spy a new chair. You are getting a sneak peak of that. I'll share more about that in another post. Really adds some sweet color to the cottage. 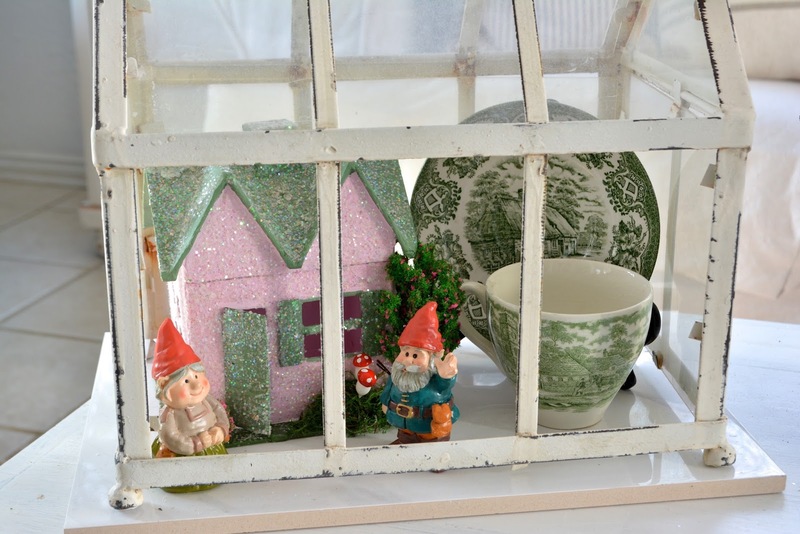 So sweet ... love the green china in there. Super cute and oh so pretty. I have one of those I wanted to foof up for Christmas and never got around to it! Yours is adorable and I love how it looks under the glass! 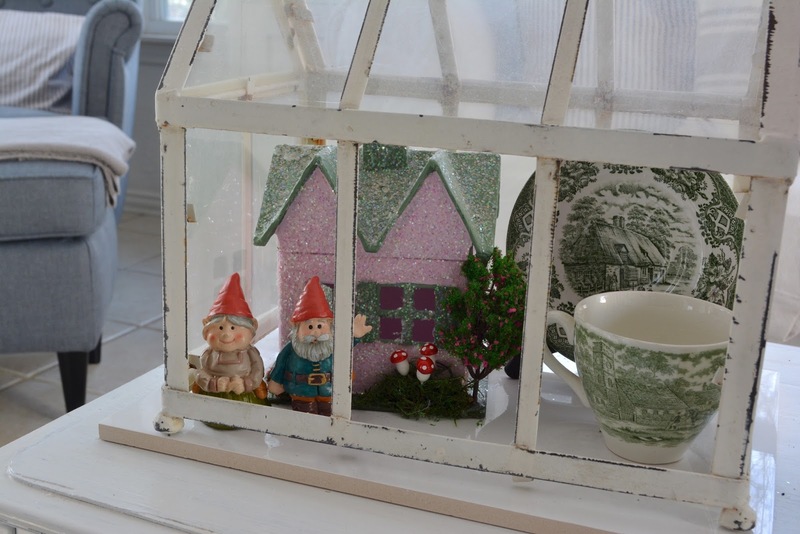 What a happy spring accent...an indoor fairy garden. 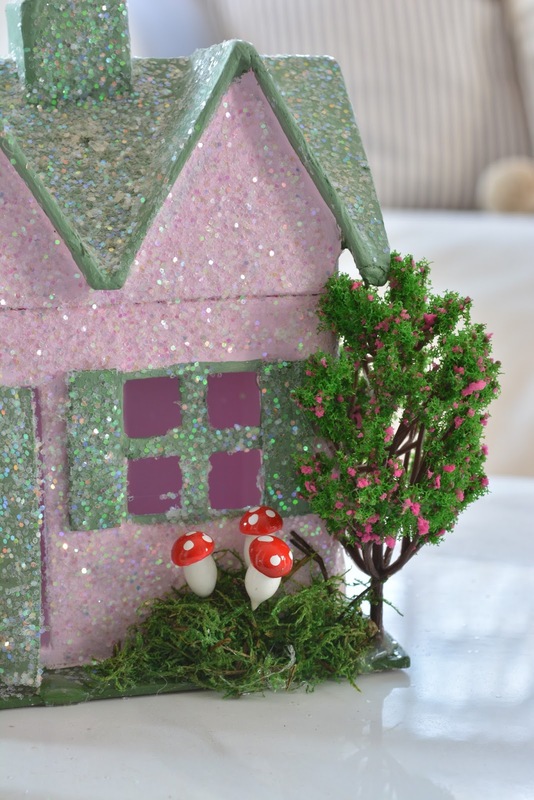 The little sparkly cottage doesn't even look like cardboard. Sweet...hope all is well with you! Love this sweet idea!! I have similar dishes!! I can not even think Spring as we are predicted to get 2-5 inches of snow here in NEPA today!! Thanks so much for visiting!! Super cute Katie! I have made a few of those house and they are so fun. I'll be pulling my spring ones out soon. I love those mushrooms. I have a couple of bunches that I love using in my craft projects! I was simply amazed at the architecture of this absolutely beautiful venue!! The environment was unbelievable. I was fortunate enough to visit New York venues like this, we found awesome things one after another after another.